Globalization as a concept has changed its premise with historic transitions made by the race of humanity and development of various port cities is associated with the process meant for encouraging trade activities among different regions/countries. The set of these coastal cities are now facing various problems of land subsidence, submergence into the sea which apparently is the outcome of various human interference in critical natural processes overburdening the entire system eventually creating an overall imbalance. The megacity of Jabodetabek – the word has its roots in the initial letters of the administrative units of Jakarta, Bogor, Depok, Tangerang and Bekasi, has an estimated population of 28 million in 2010 making it one of the most populous urban agglomerations of the world. Jakarta has been the capital of Indonesia since the Dutch colonial era with population increasing from 409,475 in 1930 to about 11.91 million in 1980. The region though experiences various urban issues but the most significant and critical among all of them is its geographical location – it is located in a lowland area with 13 rivers and 43 lakes. Mean Sea Level (MSL) of Central Jakarta was 3.42 meters in 1993 which dropped by 102 cm in 2005. North Jakarta experienced a fall from 2.03m in 1993 to 1.46 meters in 2005. The other districts have also experienced the trend. In the last few decades, industrial estates, large-scale subdivisions and new town shave proliferated in the peripheries of Jakarta; many of them converted water catchment areas, green areas and wetlands. The land conversions have eventually acted as one of the significant factors for the process of land subsidence. The infrastructural developments have decreased the water catchment areas – the catalyst being the limited water supply to the increasing population, which made water to get extracted at a rapid pace decreasing the ground water potential and its level. The region will also get affected in terms of fresh water supply with salt water intrusion through the underground links. The concentration of population in a comparatively smaller area has overburdened the entire natural system and increased the risk of various disasters. 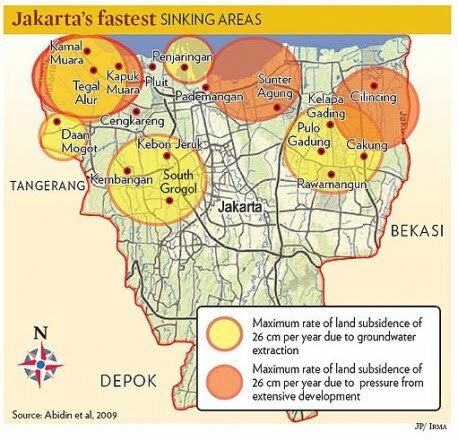 The Jakarta Mining Agency data revealed that around 80% of the region’s land subsidence is caused by various infrastructural developments in naturally-sensitive zones, especially high-rise towers, groundwater exploitation contributes around 17 % while natural factors just contributing to around 3%. City planning and developments generally are done in isolation based on land use developments with the prime focus on the transportation networks and economy generation. The wider aspects and multi-disciplinary vision including geography as one of the important disciplines has to be developed especially in the case of coastal cities which contribute a major share in the total number of million plus cities across the Globe. The driving force to the haphazard development of Jakarta region has been the case of poverty to a larger extent. People migrated at rapid pace especially in the last few decades in search of employment opportunities and to raise their living standards. A study revealed that Jakarta is sinking at a rate of 10 cm per year. 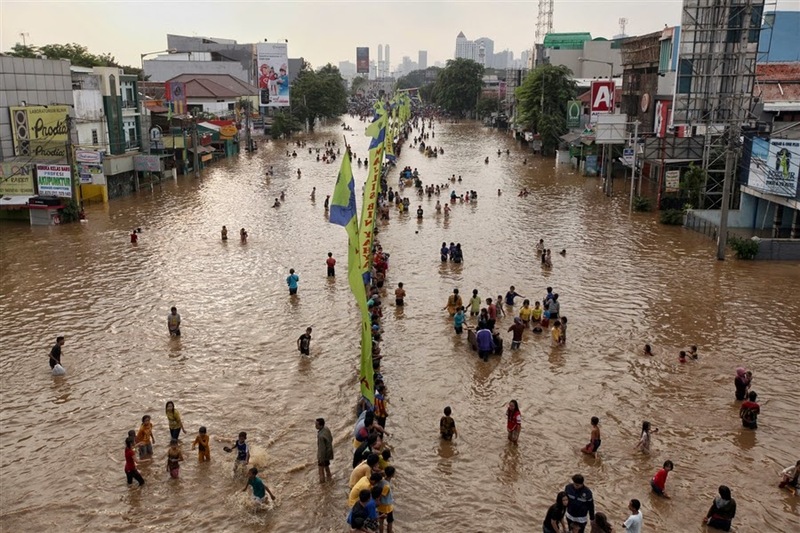 The study also suggested that about 5100 hectares of land in North Jakarta would be submerged in 2020 and the trend is set to become intense. The land subsiding and submerging will have their economic costs which may shake away the economic conditions of the entire nation like Indonesia whose economic activities are focused on Jakarta region to a major extent. The main push to guide the developmental process of the region in the right direction may not be to increase the services and facilities at large – though it may seem relevant for short-term growth, but the focus of the authorities should be on developing and planning city options with employment opportunities and increased quality of life to release the pressure on the region whose geographical location makes it highly vulnerable for dense developments, to help in the efficient development of the fourth largest populous nation of the world. The adaptations have to be made at the earliest. New Economic centres should be identified and planning should be done efficiently likewise to provide the population with an option for their healthy survival. There’s no point hyping a specific region for short-term developments and economic growth. Planners and authorities have to work and look through multi-disciplines so as to raise the nation’s status and create such urban spaces which are based on basic human living values linking it with the natural processes and eyeing on the economic development for providing the citizens a set of opportunities to explore, discover and maximize the resource utilization. Wish Indian government would learn too .Your posts are very informative. I too wish the same. Thank you Nima for your kind words.